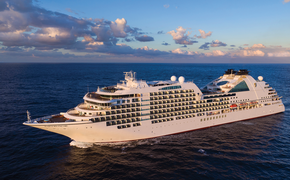 A third expedition ship, Silver Discoverer, officially joined the Silversea Expeditions fleet during a christening ceremony held March 25 at the Marina Bay Cruise Center in Singapore. A traditional Chinese lion dance performance and bhangra folk dancers provided colorful local entertainment for the quayside event. Silversea's senior executive team and company chairman Manfredi Lefebvre d'Ovidio were on hand to welcome a guest list that included local dignitaries and members of the trade and media from around the world. Following a blessing, honorary godmother Elda Turco Bulgherini, professor of navigation law at the University of Rome Tor Vergata, officially welcomed Silver Discoverer to the Silversea Expeditions fleet by cutting a ceremonial ribbon. 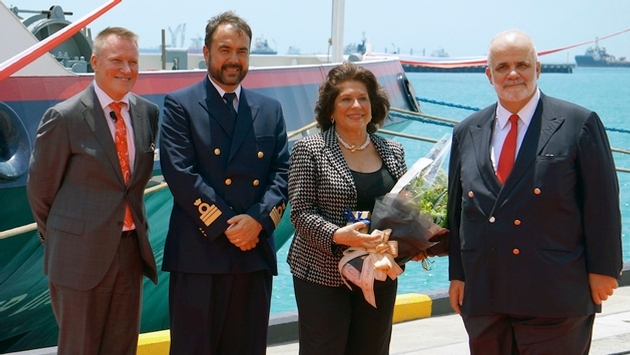 "This is an exciting and proud moment for Silversea," said Lefebvre d'Ovidio. "With itineraries encompassing some of the most fascinating and remote regions of the Pacific, Silver Discoverer will take our guests to places where few people have ever set foot — offering incredible opportunities not just for travel and learning, but for life-enriching cultural experiences." Fresh from a major refurbishment, the 5,218-ton Silver Discoverer has been updated with elegant carpets, upholstery and photography. Up to 120 guests are accommodated in 62 all ocean-view suites, each featuring an in-suite bar set-up, refrigerator, and a totally renovated bathroom, enhanced with rich marble detailing. Besides a new walk-in rainforest shower, each bathroom features a new vanity, shelving, mirrors, lighting fixtures, and wood flooring. Plus, all suites have been redecorated and outfitted with reupholstered furniture, new flat screen TVs, and new mattresses topped with luxurious Pratesi bed linens. Select suites benefit from a small private balcony. Public areas include a restaurant, main lounge (and lecture room), The Discoverer Lounge (with seating for breakfast and lunch), The Grill (for outdoor dining), an outside bar, and a small swimming pool. An all-new sun deck area has also been added, along with a fitness, beauty and massage room. All public areas have been refitted with either new or reupholstered furniture to provide Silversea's guests an expedition cruising experience in the comfortable and intimate Silversea atmosphere. Guests aboard the small-sized Silver Discoverer will be able to explore some of the world's most secluded regions and enjoy an enriching onboard program of destination lectures, photo presentations and daily recaps. Zodiac excursions and interactive walks ashore will be led by experts in their field — marine biologists, ornithologists, geologists, botanists, historians, and anthropologists. Silver Discoverer will embark on her maiden voyage from Broome to Darwin on April 2, exploring Australia's spectacular Kimberley Coast.